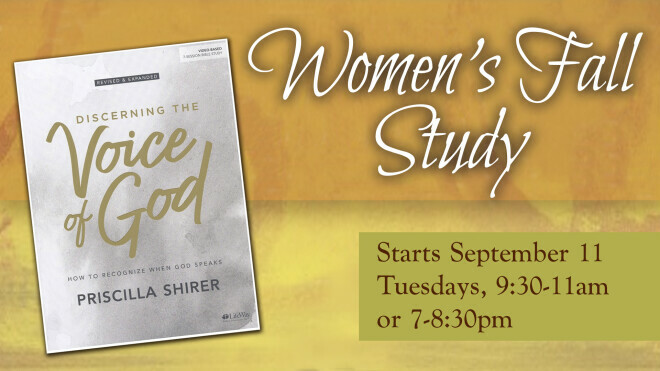 Please join the women of Arcola this fall as we study Priscilla Shirer's Discerning the Voice of God: How to Recognize When God Speaks. "Through weekly study, discussion, and fellowship we hope to explore a deeper relationship with God, discovering how we can listen with greater confidence and clarity so that hearing Him - His will, His heart, and His voice - becomes our ongoing experience." Book is available at Amazon.com, BarnesandNoble.com or Lifeway.com. Click here for the link to book. Childcare provided upon request. Please put child's name and age in the "Notes" section on the registration form. Deadline for childcare reservations is August 30.